You can either serve this drink up, in a martini glass, or on the rocks. Drink Assembly No. 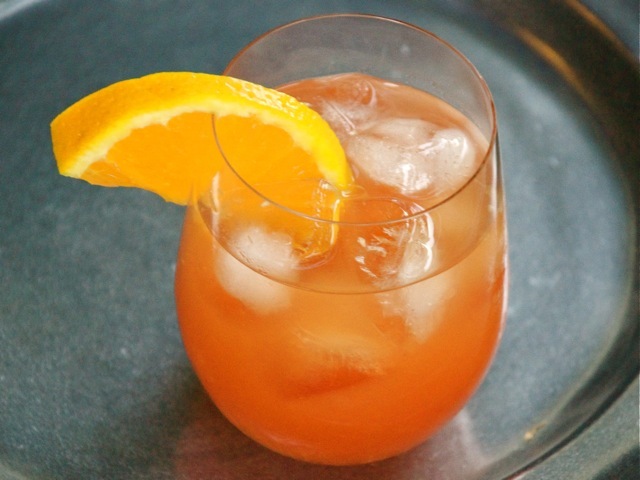 1: Combine all the ingredients (except the superfine sugar and the orange slices) in a 2-cup measuring cup, stir to mix, then divide into bucket-type glasses filled with ice before garnishing with the orange slices. Drink Assembly No. 2: Make sugar rims on your martini glasses by running a lemon wedge around the rim of the glasses, then swirling the moistened edges in a saucer of superfine sugar. Place all the remaining ingredients in a cocktail shaker with ice; shake, then strain into the glasses.